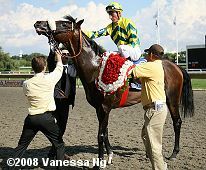 Jockey Ioritz Mendizabal celebrates aboard Spirit One after winning the 2008 Arlington Million. 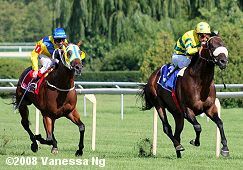 The highlight of the Illinois racing season is the Arlington International Festival of Racing at Arlington Park near Chicago, with the state's only Grade 1 events carded on the same day, all contested on the turf . Fans and participants enjoyed a sunny Saturday afternoon with temperatures in the high 70's. 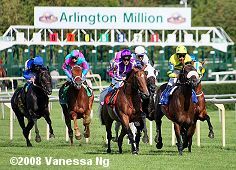 The feature race on Saturday's card of racing was the $1 million Arlington Million (G1), the world's first million-dollar horse race, and as usual a field of top turf runners from both America and Europe entered. Eight made final entry but expected pacesetter Sudan scratched out the morning of the race, leaving a field of 7 older horses to contest this 1 1/4 mile turf event. Mike de Kock trainee Archipenko was sent off as the 6-5 choice, coming to America off a two-race win streak, including the Queen Elizabeth II Cup in Hong Kong in April, and then the Summer Mile Stakes at Ascot in July. 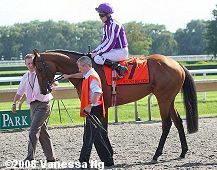 In to challenge him were 3-1 second choice Einstein, second in the Firecracker Handicap and Stephen Foster Handicap after winning the Woodford Reserve Turf Classic, all at Churchill Downs, and 4-1 third choice Mount Nelson, winner of the Eclipse Stakes last time out for trainer Aidan O'Brien. 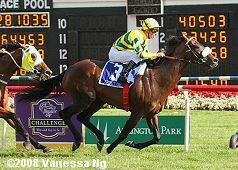 14-1 shot Spirit One was allowed to take the lead first time past the grandstand, and under new jockey Ioritz Mendizabal, he set easy fractions of 24.66, 48.57, 1:12.40, and 1:37.40, while as many as 2 1/2 lengths ahead of the rest of the field. Mount Nelson on the outside and Archipenko down on the rail stalked the pace second and third down the backstretch. Turning for home, jockey John Murtagh aboard Mount Nelson challenged the pacesetter, moving up alongside him at the 1/4 pole for the drive. The pair battled to the 1/8 pole but Mount Nelson tired. Archipenko, who was third the whole way, was pinned down on the rail by Mount Nelson at the top of the stretch, finally found room at the 3/16 pole and closed well, easily passing the tiring Mount Nelson, but was left with too much ground to make up as Spirit One easily held him off by 3/4 length , completing the trip in 2:02.17 over the firm turf. It was another 1 1/2 lengths back to Mount Nelson third, completing a sweep of the top three placings by the three European starters. 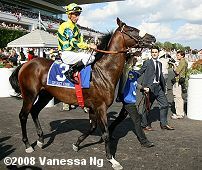 Left: Spirit One in the winner's circle. Winning trainer Philippe Demercastel said, "I was always confident as everything in the preparation had gone really well and he was jumping out of his skin. With Sudan out, we told Ioritz to ride his race. Ioritz gave him a super ride and the fact that he had to go round 2 bends helped him to breathe more easily in the race. 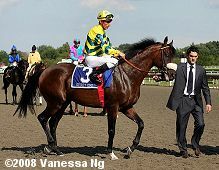 We got our revenge with Mount Nelson who beat us as a 2-year-old in a Group One race (the Criterium International at Saint-Cloud in 2006)." 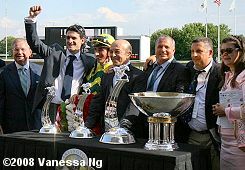 Right: The trophy presentation with (left to right) Chairman Emeritus of Arlington Park Richard Duchossois, assistant trainer Ludovic Rovisse, jockey Ioritz Mendizabal, trainer Philippe Demercastel, Bernard Sevilla, owner/breeder Kamel Chehboub, and their French translator. Left: Spirit One doesn't seem too thrilled with the flowers. 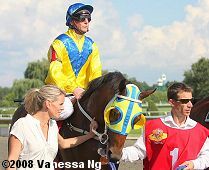 Winning jockey Ioritz Medizabal said, "This is a very good horse. I took the lead because I wanted to run my race and he responded very well for me. He quickened when I asked him to, so I never saw what was happening behind me. 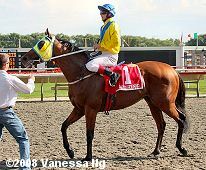 Then all I had to do was make sure he made it around the two turns, and I thank the trainer for getting him ready to do that and bringing him all the way over here to win." Right: Spirit One in the post parade, being led by his assistant trainer. Left: Spirit One in a rare quiet moment in the paddock. He was named for the 2002 animated movie Spirit about a wild horse. Right: Spirit One acting more like his usual spirited self as he heads out to the track before the race. 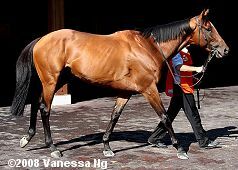 Apparently he came back to visit the winner's circle after the post parade, perhaps trying to tell everyone he planned to be there again after the race. 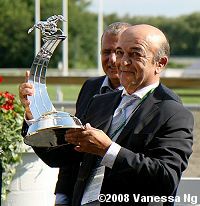 Left: Winning trainer Philippe Demercastel poses with his trophy. 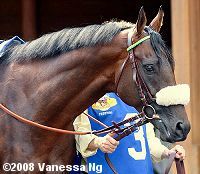 When asked if he would enter Spirit One in the Breeders' Cup Turf, he said, "Why not? We'll take him home, give him time off and definitely come back to the U.S for racing. I've been tempted for awhile, especially with this horse to try American racing." Right: Archipenko chases Spirit One down the stretch. Second place finisher and beaten favorite Archipenko returning after the race (left) and in the post parade (right). His trainer Mike de Kock, upset over his charge being pinned at the top the stretch by John Murtagh aboard Mount Nelson, said, "There was no need for Johnny to keep us in like that. That is the most ungentlemanly piece of riding I have seen in a long time. I am very surprised at Johnny, it was as if he was looking at the horse from the start." 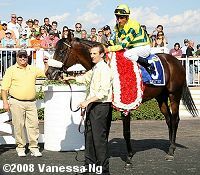 His jockey Kevin Shea said, "I had so much horse I should have never lost. Johnny had me trapped all the way around, and when it was time to go I begged him to let me go and he wouldn't let me through. If he had had half a chance to win the race I would have said fine. Anyway, that's racing but it's a long way to come for a second." Third place finisher Mount Nelson in the post parade (left) and paddock (right). 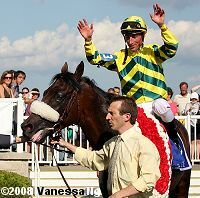 His jockey John Murtagh said, "My lad ran well. I had a good trip. I secured a pocket on the rail and was where I wanted to be. I followed the winner and I looked up at the half-mile pole and we were going very smooth. I thought I was going to get him but he didn't stop, instead he quickened away. My horse just stayed on at the one speed. You can't win them all."